I should note that I’m an attorney with a good understanding of license, trademark, and copyright law. I’m also a software developer with 20 years’ experience. So your own read-through may take more or less time, accordingly. Update: Now as an infographic! Slideshows made with Photo; same deal, don’t even think about using them for some commercial purpose. I can’t sell access to my Mac via any kind of screen sharing. I gotta run it on Apple hardware (no Hackintoshes). I can’t help anyone else do that. I can make one copy as a backup. I can’t try to figure out the source code to any of this. I can leave the software on the Mac if I sell it or give it away. I better not use anyone else’s hacked version. I cannot, don’t even think about it, just plain can’t, make money from MPEG/H.264/AVC videos I create. For that, I need to buy another something from somebody. There you are. I took one for the team. UPDATE: Thank you to everyone for the great positive response and encouragement to write more. Thank you very much. I was afraid I’d sold my soul to the devil. It’s not that bad. Thanks God some of their rules are not compatible with the laws in my country. In my country, I can legally try to figure out the source code and diassemble everything I want. Those are called “vexatory clauses”. In my country we can make Hackintoshes. “I can’t send it to Sudan”. speaking as someone using a MAC in sudan this is sad. Mac users in Sudan still have a chance to not to destroy their machimes (and the VMs): what do local laws say? I assume that, like other corporations, Apple has a special build of their software that can be exported to embargoed countries and will bundle with equipment sold to those countries. Typically, this means removing any and all encryption software, or at least removing all the secure ciphers. Hey. Here is a country with the most iPhone iPad and many other Apple products sell value currently, in that embargoed list. why this rule? what does apple have to do with sudan? This is very likely a provision put in there by the U.S. government which considers the government of Sudan (and several other countries) to be sponsoring terrorists. Would it make it faster? So all the people that make Youtube videos on a Mac and enable monetization are in violation of this license? That’s the first thing I thought of as well. Seems possible unless they purchased software with a professional mpeg license. Wouldn’t using something like FFMPEG sidestep the problem? No, you can. Google pays the licensing fees. If you were to create your own video platform, you’d be responsible for doing that. It’s also theoretically possible they exported their YouTube video in a free format (I dunno, VP8/VP9 video) and then let YouTube handle the conversion to H.264. If we’re being honest, they probably exported and uploaded using H.264, but at least there is plausible deniability. Not really. The video you upload is the transcoded by youtube. The original mpeg/h264/avc file is never served to anyone. Isn’t iMovie, based on technicality, a separate product to El Capitan which may have separate conditions anyway? Only if they do it with the bundled/free software (like iMovie). If they use something that includes the appropriate licenses, like Final Cut, then there’s no problem. Technically not true. The instant you try to see the source code you have broken the user agreement and no longer have the “right to use the program.” Just saying. Why would anybody do Windows 10? bts, current stats by netmarketshare say more people use windows 10 than OSX. Why not? We’re all in use relationships with our various systems; the question of which way the arrow points at any given time is VERY open. A lot of conditions from a billion dollar company who doesn’t take the time to figure out how to spell EL CAPITÁN properly. Nope. Apple’s spelling is correct. Apparently they did take the time. Sorry, but the word Capitán in Spanish has an acute accent over the second a, so it really is misspelt. I believe it’s like “Los Angeles”: the American place name lost the Spanish diacritical. Apple (correctly) uses the English name, not the Spanish name. That makes it El Capitan, with any accent unceremoniously and unapologetically stripped out. Interestingly, I see that Apple also uses “El Capitan” on its Spanish web pages. If you want to charge “misspelling”, that’s where the argument perhaps could be made… but again, I’d disagree with it. 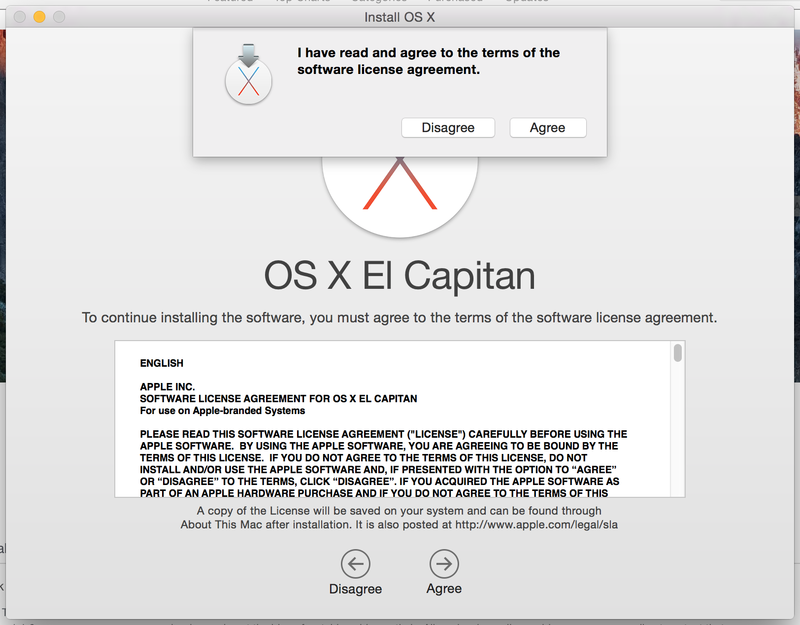 If Apple wants to set the English name “El Capitan” as their global product name, that’s their business. Many people don’t realize that English is a mongrel language that freely accepts words from other languages. Now, give how accents are extremely rare in English words, El Capitan is merely an anglicization of the Spanish El Capitán. I think the point people miss on the accent issue is that the OS is named after a mountain in California, which for whatever reason was named without the accent. I know there’s even a petition about this to Apple but perhaps it should be directed at the trustees for the National Park system first if it’s such a critical argument! Now that’s something I didn’t know – thanks! Since El Capitan is the name of a mountain in a National Park, I’m sure they can spell it how they want – with or without the acute accent. So theoretically I am allowed to run 10-20 VMs of el capitan on a mac hardware ? given these VMs are from different el capitan copies ? I’m pretty sure that’s not the case: it’s not the physical copies of the software that’s important anymore, it’s the contract (license) you enter in to with Apple to use El Capitan in the first place. That’s what I noticed too – having both a local and an offsite clone backup is illegal? I took notice of that point as well – I guess we’re allowed to have an offsite backup but ONLY of our data, not a clone? I feel so risky and dangerous breaking the rules! Haha.. i like the tone of the article. You really took one for the team.. thanks man. This all software, just not Apple. You license it. Same as the music we “but”. I find 8 and 22 surprising, and I’d bet there are thousands of people who break those on a regular basis. What a relief. I thought after I hit ‘Agree’ Apple now owned my house and I was just squatting here with my (their) Mac. re # 7. Do that mean that i can not use audiofiles of the speech text i output, comercially? I have several games in the pipeline that i cant afford to hire voice actors for, so I thought i could procedurally generate audio via built-in voices. and then basicly remix the output manually making inflections etc manually. Would this be breaking the apple EULA, then radiohead did it many years ago! I think radiohead still is on music. Did they then have to make a licencing deal? Radiohead most likely paid separately to use that voice. For your Pro Bono efforts, Thank You! I mean, seriously?! I can’t use slideshows made with *my own photos* for commercial purposes?! How can this be legal *anywhere*?! The issue is all the graphics and sound effects which Apple provides in the templates. Let me take some time to comment some of those plain English version EULA points one by one. These comments are not at the author of this blog article, but at EULA itself. And if we count this, lots of people, especially those hackintosh users, should immediately stop using Mac OS X. Not nearly as bad as I expected. Are any of these points a surprise? For me, that they’ve already preemptively removed Cuba – unless you missed that one. Robb, you’re my hero for doing this. Sorry you spent 33 minutes in Apple Hell. Over the years we have always been at the total mercy of the one sided software user agreement(s)…… at any time we can be switched off by Apple or whomever the ‘agreement’ is with…. scary stuff…. Section 4.4: If GoOgle chooses, they can disable your account and you lose access to all your files, with no recourse. Google may “…pre-screen, review, flag, filter, modify, refuse or remove any or all Content from any Service”. They can filter and block content to your computer, as well as eavesdrop on any information sent through their software. They can also modify content when it’s displayed on screen. And you won’t know they’ve done it. “Google gives you a personal, … non-exclusive license to use the software provided … you may not … copy” the Software and “you may not assign (or grant a sub-license of) your rights to use the Software”, meaning IT departments cannot install the software for use by the public on a public computer. GoOgle wants to know who its tracking, so they only allow personal licenses. “You agree to receive such updates (and permit Google to deliver these to you) as part of your use of the Services”. If you don’t want to update the software, even to a minor or any major revision, you must uninstall it. Even terminating your use of Google’s service will not stop Google from using your information, per Section 12.4, “When these Terms come to an end, all of the legal rights, obligations and liabilities … shall be unaffected by this cessation” That is unless you successfully sue. In court. In Santa Clara county. Good luck with that. Google may inject ads into any web browser session per section 16.3, “you agree that Google may place such advertising on the Services”. You not only agree to Google’s TOS, but also Adobe’s, which includes gems like 1(c) “The Chrome-Reader Software may not be used to render any PDF or EPUB documents that utilize digital rights management protocols or systems other than Adobe DRM”. Per section 7.2, “You may not… create derivative works… based in whole or part” from any content obtained through the web browser or Chrome OS without express, written permission from Google or the content provider. US Constitution be damned. Pingback: Apple wil geen OS X in kerncentrales – en meer pareltjes uit de licentie - Tech Bros.
You can’t operate a nuclear power plant with it? I also want to say thanks for your work on this – it makes interesting reading!! This was a nice reading 4 sure. I was wandering could you please do iTunes as well? Especially because of this: https://www.youtube.com/watch?v=FZ23kosLFec 😀 Thank you. High time someone are doing this. Here we have been discussing the ethics in asking the user to accept a license written in what is in practice juristic nonsense for the layman. Most of us could be selling our soul without knowing, even if we read the license agreement, because we simply do not understand what it says. Of course the companies have to protect their investments, but whats wrong with presenting the license agreement in layman’s terms with a link to the juristic document for those who can understand it? You are improving society. The world needs more people like you. Thanks, John. I really appreciate the sentiment. And yep, I do need to protect myself.